1. Ordnance Pamphlet 60 is an index for use by the Naval Service in identifying mount and turret assemblies. It indicates further mount or turret components which can be assembled with other components to form an assembly. Any assembly given does not necessarily mean that that combination exists in fact, as many possible assemblies are also included. 2. Ordnance Pamphlet 60 does not include all items in an assembly that carry a Mark and Modification. Before it is used, careful study of the General Notes (Chapter I) should be made in order to determine which assemblies are complete and which are not. A further revision is planned to include all components. Until such time as it is available, the latest revisions of the sketch lists given should be used to check the components not included in this pamphlet. 3. Ordnance Pamphlet 60 (5th Revision) supersedes Ordnance Pamphlet 60 (4th Revision), which should be destroyed. 4. This publication is RESTRICTED and should he handled in accordance with the provisions of Article 76, U. S. Navy Regulations, 1920. 1. Ordnance Pamphlet 60 has not only been revised and brought up to date, but it has also been expanded to cover 20 mm, 1".10, and 40 mm mount assemblies as well as 8", 12", 14", and 16" turret assemblies. The assemblies for the 3" field and landing guns and the 8" howitzers with 4" mounts have been omitted from this revision. This pamphlet includes three different arrangements of the assemblies rather than two as given in the 4th Revision. An arrangement by assembly numbers has been added and is called the "Assembly Number Index" (Chapter II). Another change was made in the Gun Index (Chapter IV). Here, the information is complete and it is not necessary to refer to the Mount Index (Chapter III) for full information as was necessary in the last revision. In order that ordnance pamphlet 60 may be used to its maximum advantage, certain explanatory notes concerning its use and interpretation are presented in the paragraphs that follow. 2. Explanation of Certain Column Headings in Chapters II, III, and IV. (a) Caliber: The caliber of a gun is the diameter of its bore, measuring to the tops of the lands. Caliber is usually expressed in inches or in millimeters, however, some of the smaller guns of older types are described by the weight of the projectile they shoot rather than by the size of the bore. Examples of the latter are the 1-pounder, 3-pounder, and 6-pounder guns. In this pamphlet they are abbreviated in the following manner: 1-PD, 3-PD, and 6-PD. (b) Length in Calibers: For all guns of caliber 3-inch and above the length of the bore plus the length of the chamber in inches divided by the diameter of the bore (caliber) in inches is used to express the length of the gun barrel. Thus a 3"/50 gun barrel has a caliber of 3 inches and is 50 calibers long or 150 inches. Guns of caliber less than 3 inches are not usually expressed as being so many calibers in length. Therefore, the length in caliber column has been used to complete the abbreviations of caliber for all guns with calibers under 3 inches. (c) Mount Type: In this column, three characteristics are shown. (1) If a "W" appears in the column, a wet mount for use on a submarine is indicated. (2) A numerical entry in the column indicates the number of guns in the mount or turret except that in the case of single mounts no numerical entry is made. (3) If an "S" appears in the column, it means that the possible gun elevation is 45 degrees or less. If a "D" appears, it means that the possible gun elevation is over 45 degrees. (1) If an assembly has a mount Mark and Modification, the Mark and Modification will appear in this column. In the case of 6", 8", 12", 14", and 16" turret assemblies where there are no Marks and Modifications to identify types of assemblies, the	type-and number has been substituted. (2) Mount Marks and Modifications have traditionally been determined by the Marks and Modifications of certain major components as the carriage, slide, and stand or their equivalent. This is true for the 1-PD, 3-PD, 6-PD, 3", 4", 5", 6", and 7" mounts. lugs which take the place of both the carriage and the stand have their Marks and Modifications determined by the deck lugs and slides only. In the 20 mm, and 1".10 mounts the Marks and Modifications are determined by the carriage, cradle, and stand. The cradle performs some of the functions performed by the slide of larger caliber guns. In the 40 mm mounts the Marks and Modifications are determined by only two components, the carriage and stand, there being no slide as such in the assemblies. (e) Gun Barrel: The Marks and Modifications of gun barrels are assigned without breech mechanisms, housings, machine gun mechanisms, or yokes being included. (f) Breech Mechanism, Housing, or (Machine) Gun Mechanism. The letter in the preceding column indicates whether the Mark and Modification in this column is for a breech mechanism (B), a housing (H), or a machine gun mechanism (M). (g) Carriage, Platform, and Deck Lug: The letter in the preceding column indicates whether the Mark and Modification in this column is for a carriage (C), platform (P), or deck lug (L). It is possible in 5" mounts to have both a carriage and a platform. In such cases the platform will appear underneath the carriage Mark and Modification and in the same column. (h) Powder Hoists: The Marks and Modifications given are for the upper powder hoists only. The lower and auxiliary powder hoists are not shown. (i) Projectile Hoists: The Marks and Modifications given are for the upper projectile hoists only. The lower and auxiliary projectile hoists are not shown. (j) Sketch List Number: The sketch numbers given are for the list of drawings. When checking an assembly by its sketch, care should be taken to use the latest revision of that sketch. (1) From the standpoint of record keeping and maintenance, the assembly numbers are the best source of information of Marks and Modifications for components of any mount. If an assembly number is properly assigned (this can be checked by comparison with the sketch list), only reference to the caliber and assembly number in correspondence is required in order to determine the Marks and Modifications of all the components of a mount. However, if in reporting a casualty or in commenting about a mount, only the Mark and Modification of the mount is stated, then only the Marks and Modifications of the carriage, slide, and stand can be determined. The caliber and correct assembly number are more informative than the Mark and Modification of the mount. (2) Because of the increased decentralization in the work of installing and modifying mounts by Ordnance Alterations (Ordalts), some assemblies have been changed and new assembly numbers not assigned. In some cases as a matter of expediency alternate components in certain assemblies were specified as in certain 5" assemblies either a 5" Housing Mark 1 Mod. 4 or Mark 1 Mod. 8 is possible. This situation is in the process of correction but until assembly numbers are assigned to eliminate the alternate equipment possibility, it will be necessary to note which alternative is on a particular mount. (b) Report the mount number, caliber, and assembly number as then assigned and give a complete listing of all the components bearing Marks and Modifications on the mount. (4) A turret when installed is assigned its individual assembly number which distinguishes it from any other turret of the same caliber. For turrets, the assembly number assignment is permanent, in that although the components of a turret may be changed the assembly number remains the same. Changes in turret assemblies are noted either by revising the existing sketch lists or by preparing new sketch lists if changes are extensive. 3. Brief Description of Chapters II, III, and IV. (1) This chapter is arranged by caliber. Within each caliber the arrangement is by assembly number. Each caliber has or has had at one time, assembly numbers starting at one. In certain cases where assemblies are no longer in existence, possibly through scrapping of obsolete mounts, or for other reasons, assembly numbers have been omitted from this pamphlet..
(1) This chapter is also arranged by caliber. However, within each caliber the arrangement is by mount Mark and Modification. Within each mount Mark and Modification group the assemblies are further subdivided and arranged by gun barrel Mark and Modification. (2) All 6", 8", 12", 14", and 16" turret assemblies have been omitted from this chapter since these assemblies do not have identifying Marks and Modifications. By using Chapter V the caliber, turret number, and assembly number of each turret for all ships carrying guns of such caliber can be determined. 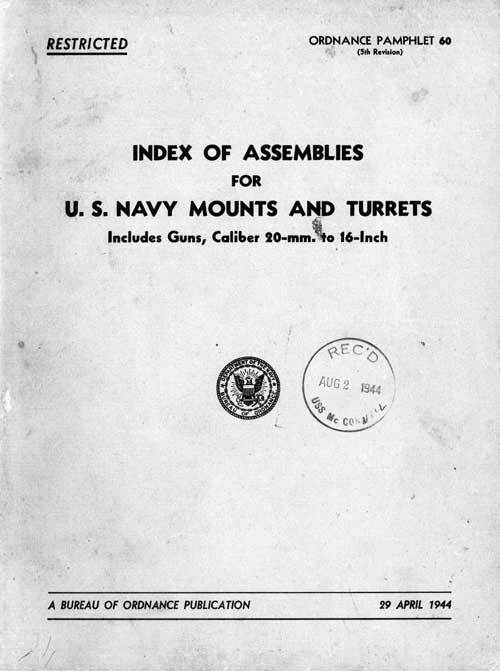 When the caliber and assembly numbers are known, the additional information concerning any particular turret can be found in the Assembly Number index (Chapter II). (1) This chapter is likewise arranged by caliber, but within each caliber the arrange-mint is by gun barrel Mark and Modification. Within each gun barrel Mark and Modification group the assemblies are subdivided and arranged by mount Mark and Modification. (2) When a mount or turret assembly has two or more gun barrels, the barrels sometimes have different Marks or Modifications. Thus, when the arrangement by gun barrel Mark and Modification is made, the barrels of such assemblies will not fall together but will be listed with the barrels of the same Mark and Modification. This means that an assembly may have its gun barrels in two or three different parts of the Gun Barrel Index if they bear different Marks or Modifications. In such cases it is necessary to refer to the Assembly Number Index (Chapter II) for complete information on the particular caliber and assembly. (3) The 20 mm, 1".110, or 40 mm assemblies are not included in the Gun Barrel Index, as they would be identical with the Mount Index, since all of the gun barrels within each caliber are the same. turrets and mounts are noted by short comments as to whether they are in service, removed, cancelled, stored, etc. (b) 20 mm Gun Barrels: Only the Gun Barrel Mark 4 Mod. 1 which is currently under production, is shown in this pamphlet as being a part of the 20 mm assemblies, however, it is also possible to use the Gun Barrels Mark 2, 3, and 4 Mod. 0 in either of the Machine Gun Mechanisms Mark 2 Mod. 0 or Mark 4 Mod. 0. (c) 40 mm Machine Gun Mechanisms: 40 mm machine gun mechanisms for the twin and quadruple mounts are assembled in pairs composed of a left-hand and right-hand mechanism for the twin and two left-hand and two right-hand mechanism for the quadruple. The left-hand mechanisms are designated Mark 1 Mods. 0 and 1. The right-hand mechanisms are designated Mark 2 Mods. 0 and 1. As units the Modifications of Machine Gun Mechanisms Mk. 1 and 2 are interchangeable. However, an effort has been made to keep all of the mechanisms on board one ship either Mark 1 Mod. 0 and Mark 2 Mod. 0 or Mark 1 Mod. 1, and Mark 2 Mod. 1. If this is not done, the spare parts situation is complicated since the essential difference between the Mod. 0 and Mod. 1 mechanisms is that certain parts are not interchangeable. In this pamphlet if right-hand Machine Gun Mechanisms Mark 2 Mod. 1 are specified in an assembly, then the Machine Gun Mechanisms Mark 1 Mod. 1. will be the corresponding left-hand mechanisms. If the right-hand Machine Gun Mechanisms Mark 2 Mod. 0 are specified, then the left-hand Machine, Gun Mechanisms Mark 1 Mod. 0 will be used. (d) How to Determine Quantities in the Indexes: If there are three gun barrels in an assembly which all bear Marks and Modifications, each gun barrel's Mark and Modification is repeated. The quantities of all items except deck lugs can be so determined. The number of times a Mark is listed under a particular component's column heading shows the quantity of that component in the assembly. In the case of deck lugs each Mark and Modification is listed but once. Thus, if there are two deck lugs of the same Mark and Modification, only one is shown. (1) The 20 mm, 40 mm, 1-PD., 3-PD. and 6-PD. mount assemblies are all complete. All components of the assemblies are given. (2) The 3" mount assemblies are complete except for Telescopes, Telescope Holders, Sight Angle Receivers, Sight Deflection Receivers, and Muzzle Covers. (3) The 4" mount assemblies are complete except for Telescopes, Telescope Holders, Director Gears, and Muzzle Covers. (4) The 5" mount assemblies are not complete. Some of the items omitted in this pamphlet are Firing and Lighting Circuits, Telescopes, Telescope Holders, Gas Ejectors, Firing Locks, Muzzle Covers, Fuze Setters, Gun Train Indicators and Indicator Regulators, Gun Elevation Indicators and Indicator Regulators, Fuze Setting Indicator Regulators, Gun Battle Order Indicators, Window Wiper Attachments, Sight Setter's Indicators, Elevation Receivers, and Training Receivers. (5) The 6" mount assemblies are not complete. Some of the omitted components are Gas Ejectors, Firing Locks, Firing and Lighting Circuits, Muzzle Covers, Telescopes, Telescope Holders, Elevation Receivers, Training Receivers, Gun Train Indicators, Gun Elevation Indicators, Sprinkler Systems, Erosion and Parallax Adjusters, and Gun Battle Order Indicators. (6) The 7" mount assemblies are complete except for Telescopes. Powder and Projectile Hoists, Lower Powder and Projectile Hoists, Parbuckling Gear, Projectile Rings, Firing Locks, Sprinkler Systems, Ventilation Systems, Voice Tubes, Ammunition Cars, Periscopes, and Periscope Mounts. "1. It has long been the Bureau's custom to designate the first piece of equipment of any particular type by the use of a Mark. Subsequent minor changes in the type have been designated by the addition of a Modification, with an appropriate number. At the same time there has grown up the custom of designating all equipment of a particular type by the use of the Mark which applies strictly only to the first of the group. "2. In order to eliminate confusion between the type as a whole and the first equipment of the type, such first model will hereafter be designated by Mark and Modification 0. "3. It will not be necessary to change existing designations." In order to make this publication more legible, zeros (0) have been omitted from the Modification columns. Nevertheless, wherever Modification numbers have been omitted it can be assumed, that Mod. 0 is applicable. The operating forces are urged to carry out the above circular letter by stating specific Modifications (Mod. 0, etc.) when speaking or corresponding about a specific piece of ordnance equipment. (g) Reporting Errors: Every effort has been made to avoid errors in preparation of these assembly sheets. However, errors and omissions may be discovered in their use. Activities concerned are requested as stated in paragraph 2k (3) of this chapter to inform the Bureau of Ordnance promptly of such errors so that they may be corrected.